Macroalgae has several drawbacks as an aquaculture feed for sea urchins. It is seasonally variable and relatively low in protein, and it can introduce unwanted organisms into the culture environment. Because macro-algae is usually >90% water content, large quantities are required for feeding. Researchers who study sea urchin nutrition have seen that in most cases, formulated feeds out-perform macroalgae as a diet. 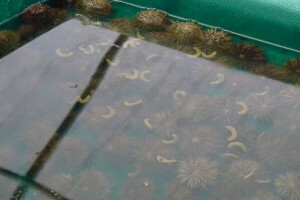 Many believe that successful commercialization of sea urchin aquaculture will only be possible when appropriate and cost effective manufactured diets are available. The CCAR has carried out several diet and nutrition trials since 2008 as part of our green sea urchin development program. 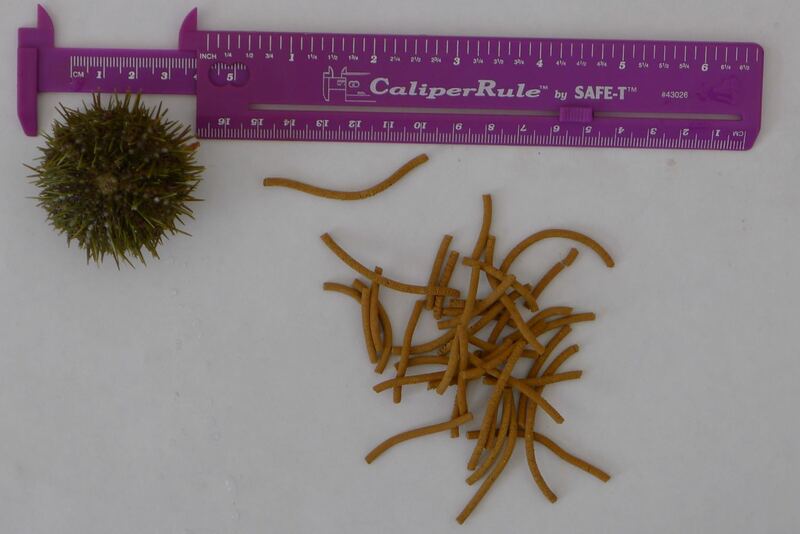 Protein & Carbohydrate Levels in Juvenile Sea Urchin Diets Our first sea urchin diet trials were in 2008-09, carried out by University of Maine graduate student Ashley Kling for her thesis work. Juvenile urchins reared from our hatchery were fed either kelp, a commercial abalone feed, or one of nine sea urchin diets formulated by Dr. Addison Lawrence of Texas A&M and Dr. Stephen Watts of the University of Alabama, Birmingham. The formulated diets differed in protein/carbohydrate ratios to help us determine: 1) an optimum protein/carbohydrate ratio; 2) whether the formulated diets resulted in better growth than the kelp diet; and 3) whether a commercial abalone feed could also serve as a sea urchin feed. In general, the results showed that diets with a protein content of 16% – 20% and carbohydrate content >40% resulted in the best growth. Most of the formulated diets out-performed kelp, but the abalone diet gave the poorest results. 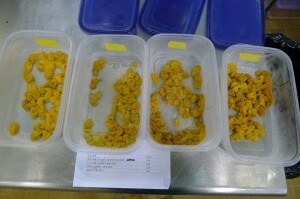 The formulated diets also caused precocious gonad development, raising questions of energy allocation and gonad quality. The effect of diet on gonad yield and quality in green sea urchins was addressed in a subsequent study in 2012-14. We carried out more nutrition and feeding trials from 2009 – 2012 during our project to evaluate grow-out of green sea urchins in tanks (Sea Urchin Growout Strategies). Diet can profoundly impact sea urchin gonad yields and quality aspects such as color, texture and taste. 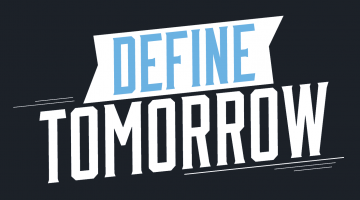 This has obvious implications not just for aquaculture but also for the capture fishery, and as a result there has been considerable interest in Japan and elsewhere in determining optimum diets for gonad development. 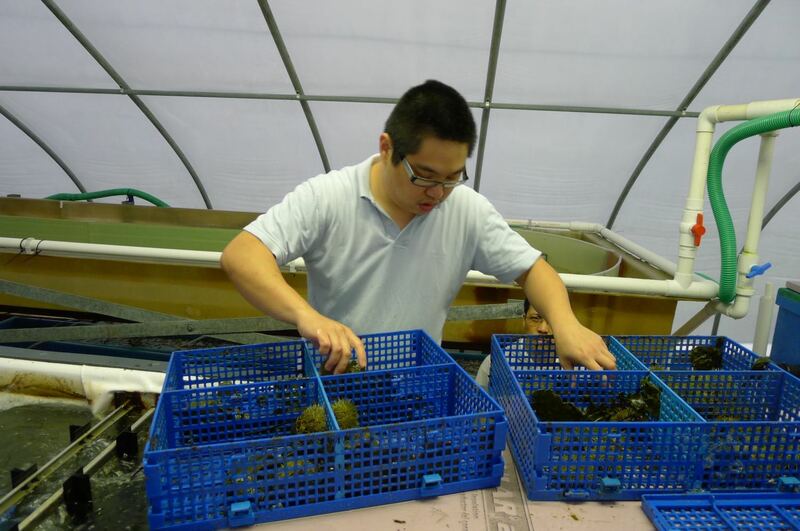 In one form of echiniculture, sea urchins are held in cages or tanks for several months and fed high quality feed, which can be macroalgae or formulated, to improve their gonad quality. This is known as gonad enhancement or bulking, and it can be likened to the practice of putting cattle on feed lots to fatten for market.